The Out@Work Network is for queer, lesbian, gay, bisexual, takataapui, fa’afafine, intersex, trans+ E tū members. We are part of the wider union movement and have a representative on the CTU Out@Work council that meets four times a year. Every two years a delegation attends the Biennial Out@Work Kamp. The next Kamp is due to be held in November/December 2018. There are many issues that our LGBTIQ+ face in the workplace that are very specific to our communities. 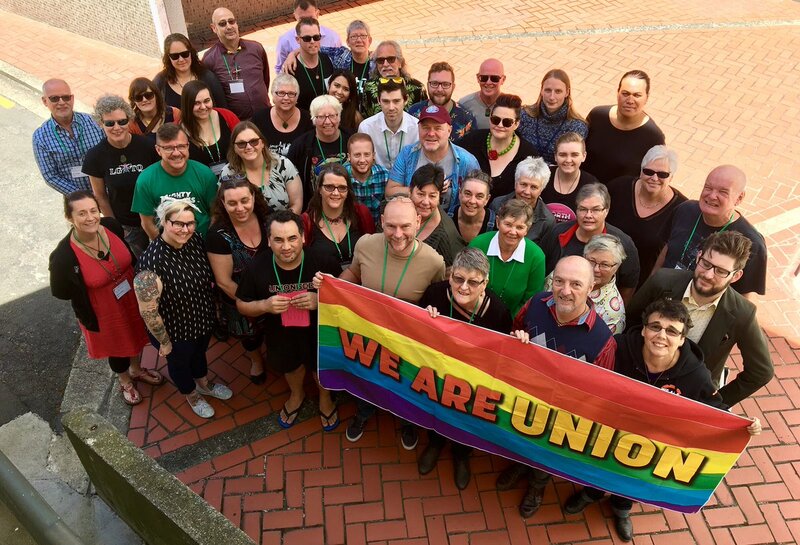 E tū, along with other unions, helped fund the creation of a diversity kit for the workplace to help workers understand the issues that our LGBTIQ+ members face (a copy is available here – outatwork.org.nz). Whilst currently not a formal structure under E tū’s rules, it is important that LGBTIQ+ members know that E tū is a safe place and that there are people available they can talk to. “Often, our LGBTQI+ members are quite hidden in the workforce because they don’t feel safe in their workplaces. Bullying and harassment are the main issues, but there is also the language people use that makes them feel unsafe. E tū understands the importance of creating a safe space for these workers to talk about their issues and to help them feel safe at their workplace.